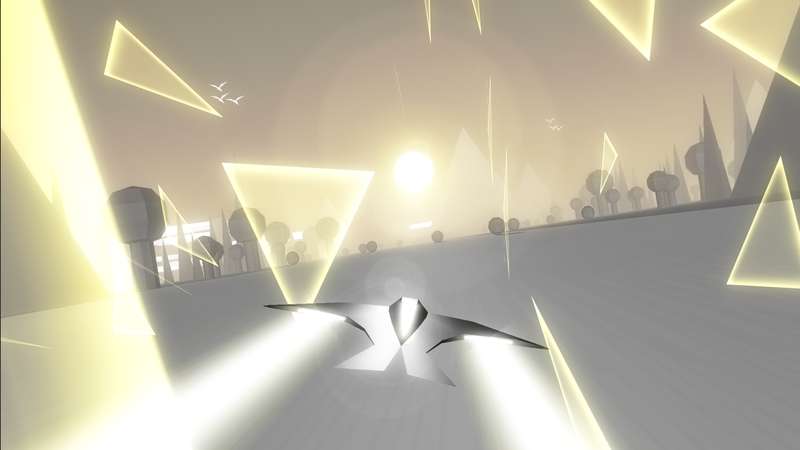 Race The Sun is a sort of open-world take on the endless runner. In it, you control a solar powered hover-craft and attempt to collect as many tris – blue, wireframe pyramids – as you can to get the highest score possible before the sun sets. The game is currently in open beta, so I decided to check it out, and so far Race The Sun’s looking like a winner. Race The Sun has only one main track, but with a catch: every 24 hours, it remakes itself. Procedurally generated levels provide a constant challenge, everything from the lay of the land to the placement of tris changing with each regeneration. User-created levels are available as well for a change of pace. The expanses before you are endless, always generating a new region (consider them stages within the larger level) to race through until you either run out of energy or crash. Hurdles such as mountains, blocks, spheres, and more conspire to bring about such an end to your pursuit. The craft is nimble, but also blisteringly fast, causing all but the most experienced pilots many an accident. The controls are responsive, mind you – it’s simply a difficult game of mastery. Race The Sun easily takes on a zen-like quality once you’ve gotten the hang of play, everything melding together as you begin maneuvering through the increasingly dense landscape. The simple aesthetic lends a strong sense of style. But simply avoiding obstacles isn’t all you need worry about; the shadows they cast threaten to render the hover craft inoperable. Even a second spent away from the sun’s gaze eats through energy quickly, the gage represented on the ship’s hull going from full to empty instantly. Special, crystal-esque pick-ups slow the sun’s descent while granting a massive speed boost. It only unlocks once you reach a certain level, though. Completing challenges like clearing four regions in a single run or traveling a certain distance advancing said level and bringing new mechanics into the fold, such as add-ons for the ship (e.g. a magnet to allow tris collection from afar) and even new modes. I didn’t complete enough of the objectives as of this writing, however, so I haven’t seen them. Developer Flippfly says the game is almost finished, which definitely seems to be the case given the seemingly complete state of the beta. There’s no release date yet (still the tentative “soon”), but it can’t come quickly enough. Race The Sun is set to launch on PC, Mac, and Linux whenever it’s released.